While cleaning the kitchen today, my 2 year old watched Barney. I don’t know how he got hooked on the Purple Dinosaur, but he loves Barney! All of the sudden my ears picked up on the topic of the show. It was about careers. Introducing my child to what he could do, or become. Did he want to be a fireman? Or a doctor? This for some reason bothered me. I saw it as so narrow minded. Too small in opportunity for what my child has the capacity to become as a Son of God. What if instead we began asking our children, and ourselves for that matter, what do you want to CREATE? Have I simply limited myself throughout my life to become something within what society has told me is available to me? I see how my life has unfolded over the last 35 years. Now, I am finally seeing myself as a Creator. I have years ahead of me to choose to create differently. To CREATE my career. To CREATE my experiences. To CREATE my relationships. To be more engaged with life by choosing to think broader and bigger than ever before even in the smallest ways. As Creators – if we dream it, we can achieve it. I think when I talk to my children about life, I will do so in this way. 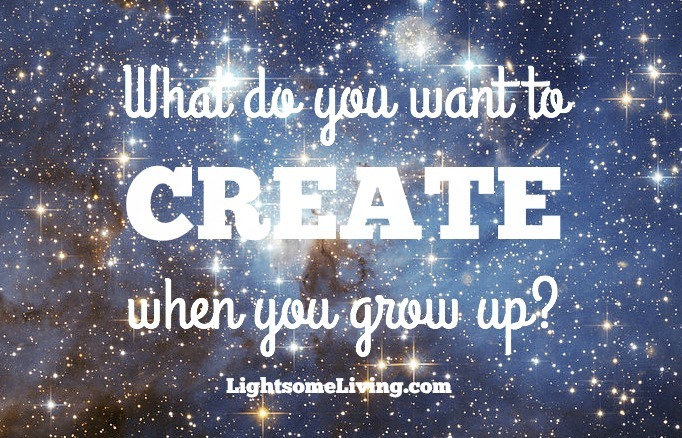 What do you want to create when you grow up?